Alex Kidd in Shinobi World is an action-platform game and Sega's light-hearted parody of its Shinobi franchise. It consists of four worlds with three acts each and your mission is to rescue your girlfriend from Hanzo the Dark Ninja. You're armed with a sword that you can slash by pressing the 1 button while 2 allows you to jump. There are treasure chests scattered around the levels that hold extra hearts / lives but occasionally they contain throwing darts so you can take out enemies from a distance. If you find a pole in the level you can grab onto it, spin around and perform a flying whirlwind attack that takes out everything in its path! Your health counter is located in the top-left and if you manage to increase it past the maximum of six you'll automatically gain an extra life. Each world is expertly designed and include a city, a harbour, a bamboo garden and a mansion. There's also tons of secret areas and alternate routes to explore if you wish. The boss battles are hilarious as they're all taken from the main Shinobi game but done in a cartoony style. The Black Turtle helicopter was always an intimidating battle but here there's tons of cute mini choppers flying around the screen and you need to destroy a certain amount to proceed! As much fun as the game is it's criminally short; with only four worlds and little in the way of challenge you can easily beat it in around 15 minutes. The controls can be unresponsive too and there's moments where you'll press the jump button but nothing happens. The music is amazing and it features tracks from the Shinobi series that have been remixed in an upbeat manner with different chord progressions. Alex Kidd in Shinobi World is a hidden gem in the Master System library and it's a shame that few people have heard about it. The short length is a genuine complaint but the gameplay is so addictive that you'll want to replay the whole adventure over and over again! 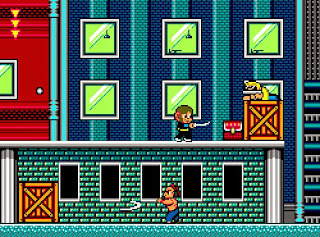 Random trivia: The game's original title was Shinobi Kid and there's evidence to suggest that Alex Kidd was never supposed to star in this parody. Prototype screenshots exist that show a different lead character as well as a boss called Mari-Oh that has an uncanny likeness to a famous Italian plumber!